We investigated the association between diet and head and neck cancer (HNC) risk using data from the International Head and Neck Cancer Epidemiology (INHANCE) consortium. The INHANCE pooled data included 22 case–control studies with 14,520 cases and 22,737 controls. Center-specific quartiles among the controls were used for food groups, and frequencies per week were used for single food items. A dietary pattern score combining high fruit and vegetable intake and low red meat intake was created. Odds ratios (OR) and 95% confidence intervals (CI) for the dietary items on the risk of HNC were estimated with a two-stage random-effects logistic regression model. An inverse association was observed for higher-frequency intake of fruit (4th vs. 1st quartile OR = 0.52, 95% CI = 0.43–0.62, p trend < 0.01) and vegetables (OR = 0.66, 95% CI = 0.49–0.90, p trend = 0.01). Intake of red meat (OR = 1.40, 95% CI = 1.13–1.74, p trend = 0.13) and processed meat (OR = 1.37, 95% CI = 1.14–1.65, p trend < 0.01) was positively associated with HNC risk. Higher dietary pattern scores, reflecting high fruit/vegetable and low red meat intake, were associated with reduced HNC risk (per score increment OR = 0.90, 95% CI = 0.84–0.97). Shu-Chun Chuang worked on this study during the tenure of a Special Training Award from the International Agency for Research on Cancer. This INHANCE Consortium was supported by a grant from the US National Institutes of Health (NIH), National Cancer Institute (NCI), (R03CA113157) and National Institute for Dental and Craniofacial Research (NIDCR; R03DE016611). The individual studies were funded by the following grants: Milan study: Italian Association for Research on Cancer (AIRC). Aviano: Italian Association for Research on Cancer (AIRC), Italian League against Cancer and Italian Ministry of Research. France study: Swiss League against Cancer (KFS1069-09-2000), Fribourg League against Cancer (FOR381.88), Swiss Cancer Research (AKT 617), and Gustave-Roussy Institute (88D28). Italy Multicenter study: Italian Association for Research on Cancer (AIRC), Italian League against Cancer and Italian Ministry of Research. Swiss study: Swiss League against Cancer and the Swiss Research against Cancer/Oncosuisse (KFS-700, OCS-1633). 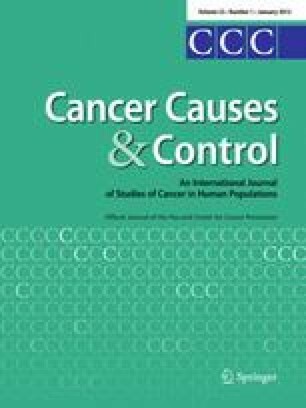 Central Europe study: World Cancer Research Fund and the European Commission’s INCO-COPERNICUS Program (Contract No. IC15-CT98-0332). Seattle study: National Institutes of Health (NIH) US (R01CA048996, R01DE012609). North Carolina study: National Institutes of Health (NIH) US (R01CA61188), and in part by a grant from the National Institute of Environmental Health Sciences (P30ES010126). Tampa study: National Institutes of Health (NIH) US (P01CA068384, K07CA104231, R01DE13158). Los Angeles study: National Institute of Health (NIH) US (P50CA90388, R01DA11386, R03CA77954, T32CA09142, U01CA96134, R21ES011667) and the Alper Research Program for Environmental Genomics of the UCLA Jonsson Comprehensive Cancer Center. Puerto Rico study: jointly funded by National Institutes of Health (NCI) US and NIDCR intramural programs. Latin America study: Fondo para la Investigacion Cientifica y Tecnologica (FONCYT) Argentina, IMIM (Barcelona), Fundac¸a˜o de Amparo a` Pesquisa no. Estado de Sa˜o Paulo (FAPESP) (No 01/01768-2), and European Commission (IC18-CT97-0222). IARC Multicenter study: Fondo de Investigaciones Sanitarias (FIS) of the Spanish Government (FIS 97/0024, FIS 97/0662, BAE 01/5013), International Union Against Cancer (UICC), and Yamagiwa-Yoshida Memorial International Cancer Study Grant. Boston study: National Institutes of Health (NIH) US (R01CA078609, R01CA100679). Rome study: AIRC (Italian Agency for Research on Cancer). US Multicenter study: The Intramural Program of the National Cancer Institute, National Institutes of Health, USA. MSKCC study: NIH (R01CA51845). Seattle-LEO study: NIH(R01CA30022). Western Europe Study: European Commission’s 5th Framework Program (Contract No. QLK1-2001-00182), Italian Association for Cancer Research, Compagnia di San Paolo/FIRMS, Region Piemonte, and Padova University (Contract No. CPDA057222). Saarland study: Ministry of Science, Research and Arts Baden-Wϋrttemberg. Heidelberg study: Grant No. 01GB9702/3 from the German Ministry of Education and Research. Japan study: Scientific Research grant from the Ministry of Education, Science, Sports, Culture and Technology of Japan (17015052) and grant for the Third-Term Comprehensive 10-year Strategy for Cancer Control from the Ministry of Health, Labor and Welfare of Japan (H20-002). See Tables 10 and 11. See Figs. 1, 2, 3, 4, 5, 6.